A tour through 4chan’s notoriously toxic /pol/ forum shows what the poster was so worried about. Yang is a minor player in the Democratic primary so far, an entrepreneur and political outsider with no traditional base of support. But on /pol/, he’s the only candidate that matters. The boards are full of Yang-related memes, including familiar faces like Wojak and Pepe. One reworked the Virgin / Chad meme (contrasting a dejected virgin with a carefree and popular Chad) to show Yang triumphing over a humiliated Trump. Other images are more disturbing. One meme showed Yang redistributing wealth from a Jewish banker caricature, the kind of noxious anti-semitism that’s common on /pol/. Another warning about meme sabotage landed on /pol/ around the same time as the Reddit post, but the local trolls were unfazed. It’s part of a larger tension for the Yang campaign, which has emerged as an unusual force in the presidential race. 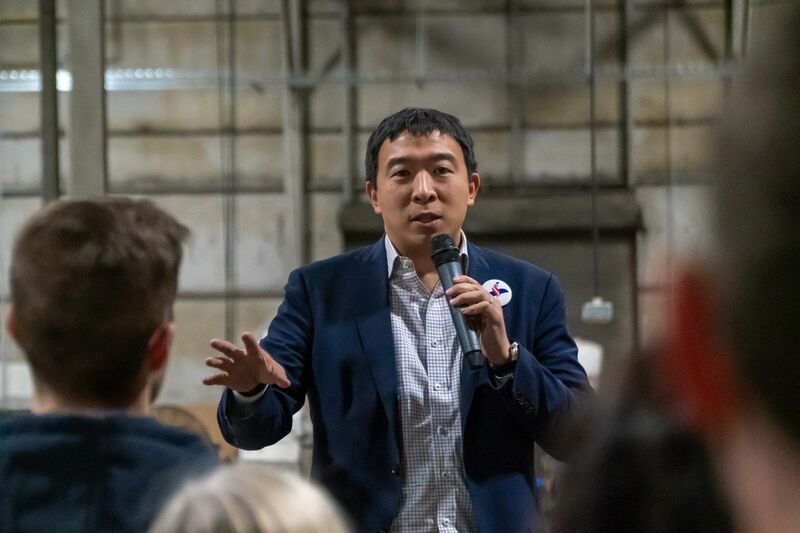 With only minimal experience in politics, Yang has built his campaign around the unconventional promise of a $1,000 monthly basic income, combined with Medicare for All and an economic policy he calls “human-centered capitalism.” Yang has found an unusual outpouring of support online, potentially earning a spot in the upcoming debates on the basis of fundraising alone. But that support has come with unusual liabilities, as enthusiasm for the candidate mutates into something uglier and harder to control. 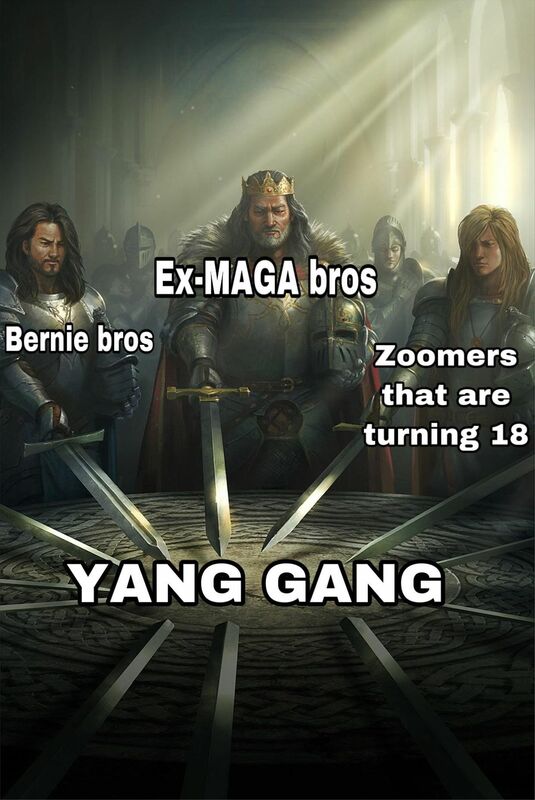 Yang’s supporters — known online as the “YangGang” — seem to be drawn from across the political spectrum. According to the Daily Beast, Yang saw a surge of new supporters after an appearance on the Joe Rogan Experience in February, often a crossover point between mainstream culture and the fringe right. At the same time, his Universal Basic Income proposal has proven genuinely popular with younger voters disenchanted with conventional politics. The campaign said they haven’t made any particular effort to target Trump voters, but had been drawn to unconventional outlets out of necessity. Without the clout of an establishment candidate, the campaign can’t rely on mainstream coverage, which makes fringe outlets like Joe Rogan or conservative outlets like Tucker Carlson difficult to turn down. Yang was also recently seen at a Turning Point conference, seemingly fitting into the same pattern — although the campaign says he was in DC for a separate event and only stopped for a picture, not appearing at the conference itself. The result is a noticeable rift among Yang supporters online. Multiple subreddits have already been locked, either wary of 4chan invaders or outsiders scrutinizing their content. The infamous /r/thedonald community has also posted Yang links, although it’s unclear if it’s meant as a brigading campaign or genuine support from disaffected Trump voters. When hostile invaders do swarm the official subreddits, it’s never clear where they’re coming from. Update 7:04PM ET: Updated with campaign statement on the Yang sighting at Turning Point.